Whey and casein protein powders contain essential amino acids, which are quickly absorbed when compared to the essential amino acids in the foods you eat. 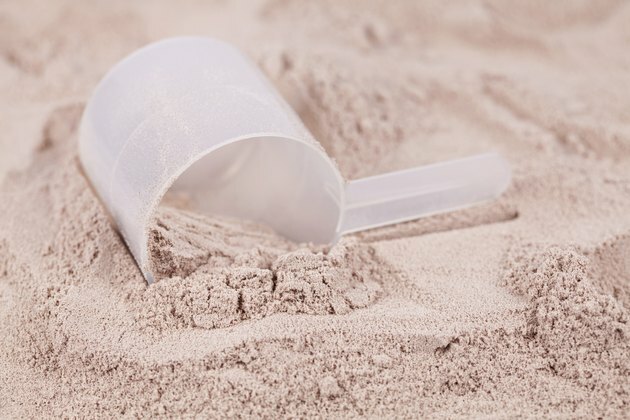 Protein shakes made with these powders are best consumed immediately before and after your workouts, especially with resistance training sessions. Such shakes prime your cells to synthesize or make protein for muscle repair, remodeling and growth, according to a 2010 article by Tim Ziegenfuss, Ph.D., and colleagues. Whey protein has a greater percentage of amino acids when compared to casein powder, so it is better for increasing your strength and muscle size. Mix your protein powders in a hand-shaker cup if you will be mixing it with juice or skim milk and do not have access to a blender. Scoop your powder into a blender with cold liquids and frozen fruit for a thick shake; electric mini-blenders are available to take with you to the gym for use immediately after a workout. Mix one to three scoops of powder with juice or skim milk, depending on your weight; you need between ¼ g to ½ g of protein per kilogram of body weight, noting one scoop of protein powder typically has 24 g of protein. Use a 2:1 ratio of carbohydrates to protein in your shakes if your goal is to increase your strength and muscle size. Use a 3:1 ratio if you are in a team sport; if you do primarily aerobic exercise, use a ratio of 4:1, according to Ziegenfuss et al. Use whey powder for maximum performance gains. Combine whey and casein powders if you will not be adding fruits or fruit juices, such as if you are on a low-carb diet. Use vitamin D-fortified skim milk to make your shake, increasing the likelihood you are consuming a sufficient amount of calcium and vitamin D. Drink 3 cups of skim milk and eat one more serving of dairy to meet the 1,000 to 1,300 daily recommended intake of calcium; calcium helps to preserve your bone health and bone strength, particularly essential for maintaining and improving your performance, writes Vu H. Nguyen, M.Ed., in a 2010 article published in "NSCA's Performance Training Journal." Consuming an adequate amount of vitamin D may reduce your risk of stress fractures, depression and musculoskeletal pain, advises registered dietitian, Rikki Keen, in a 2010 article published in "NSCA's Performance Journal." Make your shake with cranberry juice to help prevent urinary tract infections or UTIs, advises MedlinePlus.gov; 1 cup of no-sugar, 100 percent cranberry juice has around 32 g of carbohydrates. Add 10 oz. of juice or 1 ¼ cup to a post-workout shake or divide between your pre and post-workout mixes. Make your pre-workout protein powder shakes with an apple or orange, for lasting energy. Mix your post-workout shake with pineapple, banana or mango for better nutrient absorption. Protein powders are dietary supplements. This means you must follow a nutritious dietary plan, using whey and casein to enhance your performance without replacing wholesome, nutrient-rich foods.